As is my custom, I rarely go to newly opened restaurants right away. It’s not that I have anything against it, or are afraid to try something new, it’s just something that rarely happens. Maybe I’m just not hip or cool enough. Maybe I like to let others experiment first. The last time I went somewhere early was Distrito, and I had a great experience then. So when I got to decide on a place for my birthday, I thought perhaps I should go against the norm and go somewhere new, like El Camino Real. Well, perhaps I should have gone with my gut and not gone there. The place is dark and loud. I went on the night of the Eagles game so it was fairly dead. I’d say the place was maybe 1/5th full. I really wanted a booth, but we got seated at a table instead. Right next to the kitchen and the bar, a fairly high traffic spot. Did I mention how loud it was? And it seems like they have the Quentin Tarantino soundtracks on a loop. It started off on a bad foot as our waiter didn’t even show up at the table right away. It took unnaturally long for him to even come by and give us menus. If I notice, then you know it’s too long. And I already mentioned how not busy it was, right? Ok, on with the food. So the place serves bbq as well as mexican. We ordered a thing of chips and salsa, which aren’t free, but it’s neverending refills. It came with two different salsas, one verde and one smoky pico de gallo. The salsa verde was just fine. And normal. The smoky pico de gallo was strange. The “smoky” equated to being doused with liquid smoke. It was just strange and pretty much wrong. I love me some pico de gallo. It’s fresh, that’s what’s good about it. Fresh tomatoes, fresh onions, fresh cilantro, fresh lime juice. So when you throw artificial liquid smoke flavor on it, it’s just bizarre. You know it’s not natural. I don’t know whose idea it was, but they should just go with fresh pico. For the love of mexico, please. The chips were fine though. Crunchy and not too greasy. J got the taco salad. 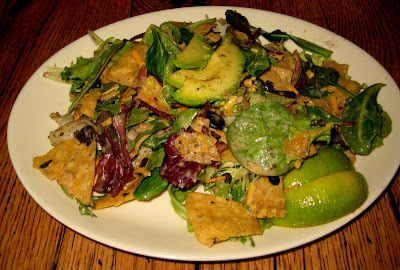 He liked it, but he expected it to be more salad, and less taco chips. It was loaded with chips, and not loaded with actual greens. So not quite salad-y enough. 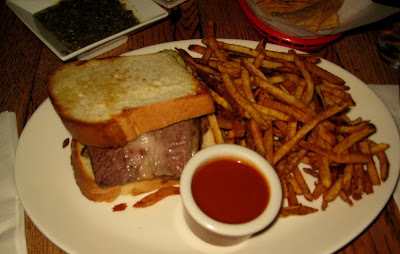 So I got the brisket sandwich on texas toast. You get to pick what kind of bbq sauce you want, sweet or spicy. I’d read that the spicy was too damn spicy, so I went with sweet, which I liked. It also comes with fries, which I enjoyed very much, and pickle slices. So as you may be able to observe with your own peepers, you can clearly see what the problem with this sandwich was. Seriously. Does ANYTHING have to be so fatty? I mean, did I order a fat sandwich? No, I ordered a brisket sandwich. And believe you me, having lived in Austin, I’ve had my fair share of texas bbq. And no brisket I’ve ever had looks like the brisket that was in this sandwich, and no brisket I’ve ever had EVER has any fat on it, let alone 33% fat. It was seriously disturbing. Which is a shame really, because once the fat was hacked off, it was fine. Not great, but fine. Acceptable for being Philadelphia. And just to show you that I was not being a crybaby or extra picky, just look at all the fat that I had to remove from the meat. 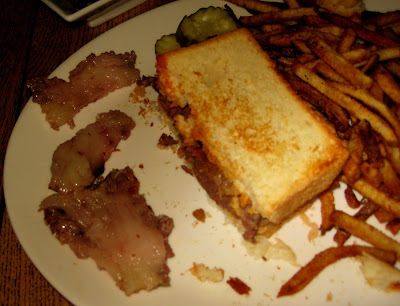 Literally, each slice of brisket was practically divvied into thirds, with the middle third being a big strip of fat. Gross. I was actually surprised that they would serve something like this. Shame on you! I would have said something, but I was just so disappointed and it was my birthday, for pete’s sake, that I just didn’t have the energy. I should have recognized it as a bad sign when immediately after I ordered the food, our waiter came right back and asked which sandwich I had ordered. For someone who’s sole job is to take food orders and then serve them, he’d already screwed half of his job up. Sure, he looked like a mocha version of sideshow bob, but that did not make up for him being a bad waiter. In fact, he really wasn’t particularly good. And neither was the food. And thus, on my birthday, I was severely underwhelmed. The owner was there too that night. If I see him again, I’m going to do everyone a favor and say something to him! I promise! HOW DID YOU “LET” THEM SEAT YOU AT A TABLE BY THE KITCHEN AND YOU “REALLY” WANTED A BOOTH…. JUST REMOVE THIS REVIEW!!!!! They actually smoke the tomatoes before chopping them for the pico de gallo, you can tell it’s not liquid smoke because there is no artificial taste. It might be a little different to have a smoked salsa presented to you with chips, but it’s not fake.